After months of work installing new suspension, big brakes, steering, cooling system and 3.55 rear axle the a/c compressor locked up on my 3rd drive. Here in the south a typical day is 95 deg. 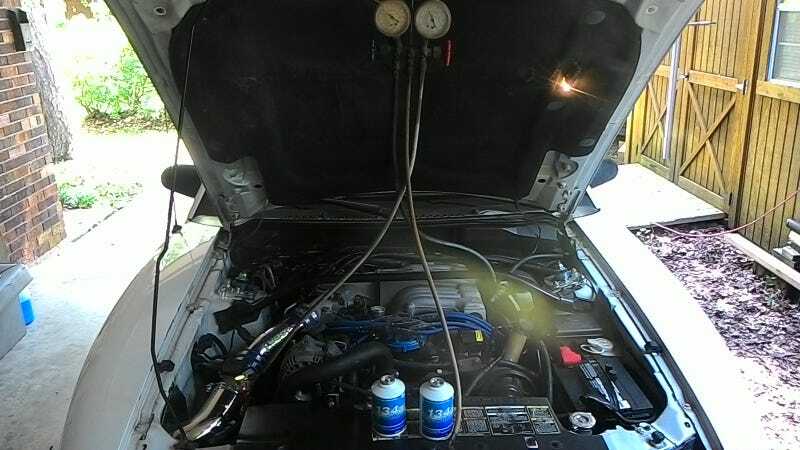 and 95% humidity so a/c is a must if you are to enjoy the ride, so new compressor w/clutch, accumulator, liquid line(with orifice tube) and condenser installed, high pressure manifold lines and evaporator flushed, I pulled the system down to 29.inHg and installed 34 oz. of R134. Viola! ice cold air coming from the vents. I’m happy, time for an ice cold adult beverage!